This article was written by Fiona Lake and appeared in Issue 101 June/July 2015 of R.M. Williams Outback magazine.  Images have been provided by Hot Air. Hot Air’s balloons taking off in the early light of a Tableland’s morning. Head torches bob busily around a bare paddock fringed by ghost gums barely visible in the predawn gloom. With some trepidation, groups of 24 passengers look on. With military-like precision and speed, padded wicker baskets are unloaded, stainless steel wires are attached and colourful nylon fabric is carefully laid out. 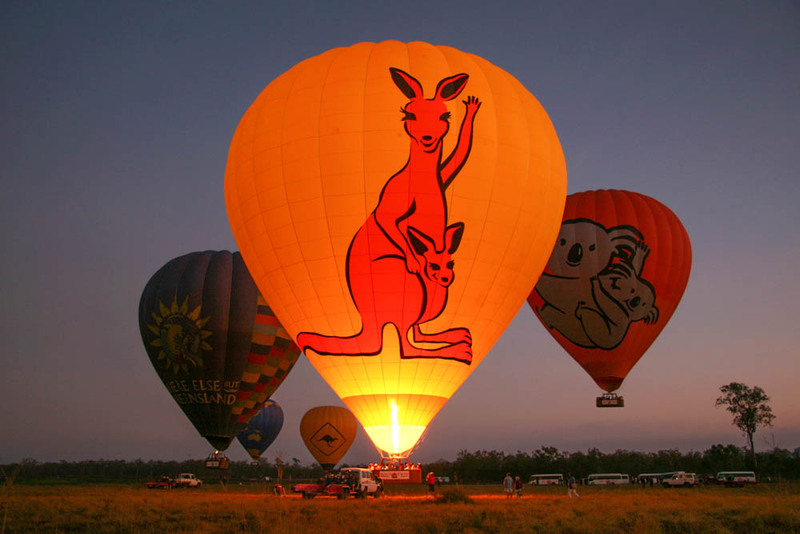 Propane gas cylinders are fired up and fans push the heated air sideways into the balloon opening. In a surprisingly short time, the massive balloons fill with 130,000 cubic metres of air heated up to around 100 degrees Celsius, and begin to rise. Eventually towering 10 storeys high and glowing from the inside whenever the gas burners blast on again, hot air balloons are a truly awe inspiring sight. At the call, passengers make haste to the creaking baskets and clamber in. The burners are cranked up and the rope attaching the basket to the vehicle is cast off. One by one, the balloons effortlessly lift passengers collectively weighing more than 1.5 tonnes up into the slowly lightening sky. 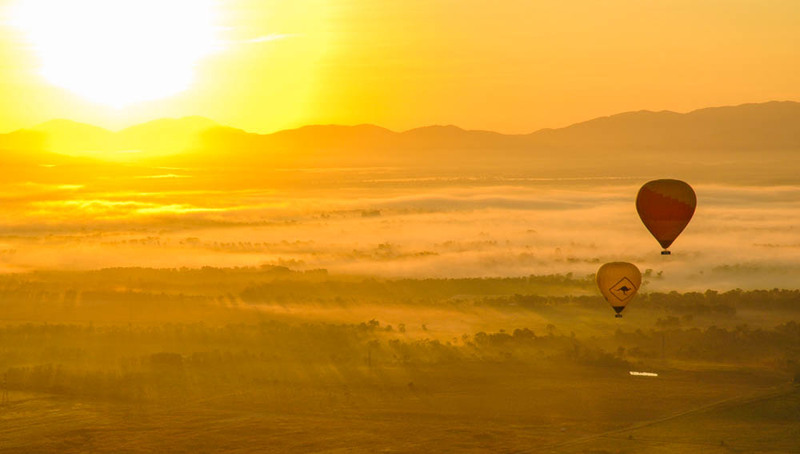 Apart from the occasional whoosh of burners reheating the air, the largest single-pilot balloons in the world creep across the tropical landscape in complete silence. Soaring hawks and grazing wallabies and livestock pay little attention as the parties of people from all over the world gently float past. When the sun rises over the rainforest clad hills not far from Cairns, on Far North Queensland’s coast, fabulously elongated shadows stretch across the farmland far below. Even at the typical cruising height of 1000m, kookaburras and other dawn-chorusing birds can be clearly heard. The absence of wind is also surprising. 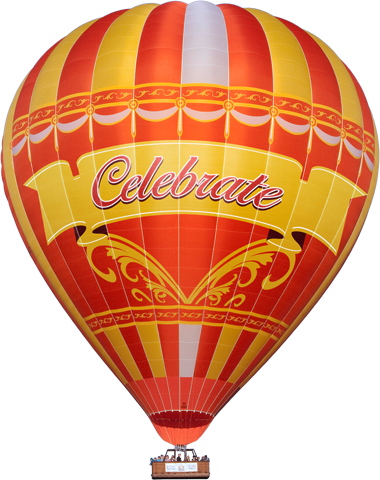 As balloons float with the breeze, the only wind movement felt by passengers is during a rapid ascent or descent. No sensation of movement at all, which is a big surprise, says passenger Kerry Tuite, visiting from Brisbane. Even nervous flyers are soon at ease. 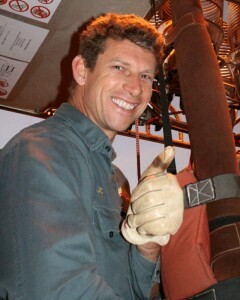 Johan van der Vyver is chief pilot for Mareeba ballooning company Hot Air. Throughout more than two decades of flying, he has never had a passenger ask to be returned to earth early. But many want to stay up longer. There are no restrictions on who can fly. The only requirements are the ability to climb into the basket and get out of bed well before dawn, so you can be picked up in Cairns, Port Douglas or Mareeba. Like most aviators, Johan cannot imagine doing anything else for a living. Growing up on a 20,000-hectare South African Merino farm, he remembers lying on his back during a drought, looking up at the clouds floating past and wishing I was one of them. “When I went ballooning in Switzerland in 1991, I thought this is it” he says. It’s like a dream come true.” He returned to his secure job as an IT manager in Johannesburg, but left not long after to qualify as a balloon pilot. He has since been involved in ballooning in 11 different countries. 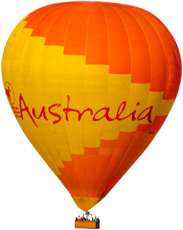 Johan is now an Australian citizen and has worked for Hot Air for nearly 15 years. 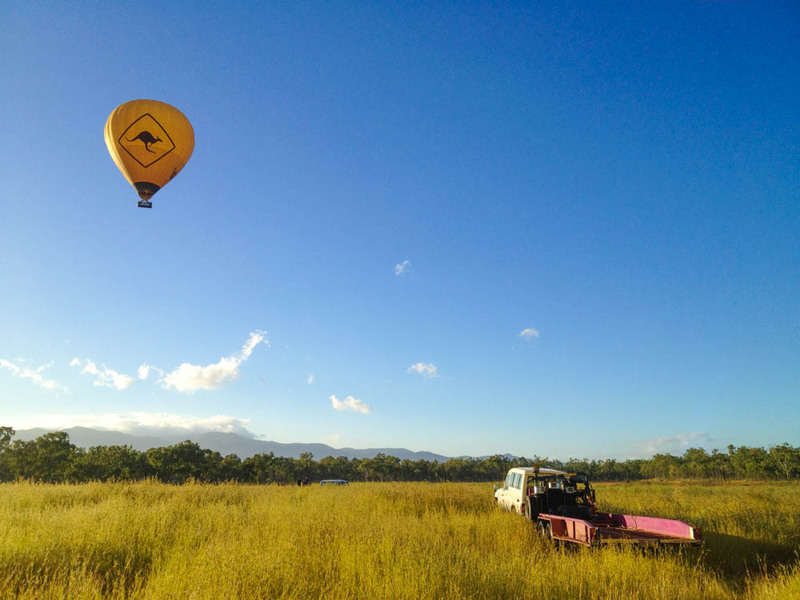 Floating over the Mareeba end of Far North Queensland’s Atherton Tableland, there is a gradually changing vista of tropical plants such as lychees, bananas, sugarcane, mangoes and papaya, sprinkled with other crops as diverse as wheat and rice, basil, potatoes and corn. In total, the region hosts more than 40 different crops plus other agricultural industries such as aquaculture. Balloon Landing locations are quite often peanut paddocks.  Passengers are advised to avoid wearing white because, while most landings are gentle, they usually encounter some of the bright red volcanic soil during the fun of helping to packup the balloon. Relatively little has changed in hot air ballooning since the Montgolfier brothers first manned balloon flight in France in 1783. Reliable weather is still the most vital ingredient, which is one of the reasons why Mareeba is an ideal location, averaging more than 300 sunny days annually and protected from fickle coastal breezes. Apart from a few fancier materials and the addition of a balloon air temperature thermometer, altimeter (measuring height), variometer (vertical lift) and radios, today’s equipment is fundamentally the same. The spitometer (spitting over the side) is still used to test wind direction below the balloon, and the strength and flexibility of wicker baskets means they are still standard. A hot air balloon descends for landing. Vertical movement is relatively straightforward but changing direction is only possible by altering height and catching breezes heading in different directions. Add the 30-second delay between pilot action and the response of a fully laden balloon, and it’s obvious that experience and a cool head are essential. You can read more from Fiona Lake and view her extensive photo gallery at her website Fiona Lake. Connect with Fiona on Twitter @FionaLakeAus.